Murals in the Market Walking Tours 2019 – A Visual Feast! Come Experience the brand new Murals in Eastern Market, created during the 4th Annual International Mural Festival! Building on the momentum of the last three years, vibrant public street art comes to life on even more buildings all over the Eastern Market District. Experience an up close & behind the scenes look at the murals as we stroll around the District and share information about the Festival as well as the artists’ unique stories. There is nothing like seeing these incredible large-scale works of art for yourself. You will not want to miss being among the first to see the new murals! 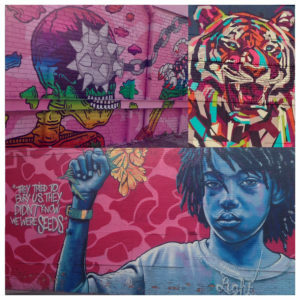 Enjoy strolling around the Eastern Market District, experiencing some of the over 50 freshly-painted murals, as well as some murals from past years, created by artists from Detroit and all over the world, as our guides tell you the stories behind them! The Murals in the Market Festival was created and is run by 1xRUN and the Eastern Market Corporation. For a full list of the Festival’s sponsors, visit www.MuralsintheMarket.com. Each participant will receive a map of the murals to continue exploring on their own in the future – we will be covering some, but certainly not all, of the 45+ new murals! Murals Tours generally range from 1 to 2.5 hours, depending on your transportation, special requests, size of group, and budget. Tours of the murals can also be combined with other locations/elements around the City to complete your tour experience. Enjoy hearing about the rich history of Detroit’s Eastern Market District, as well as current development, and food and art happenings in this vibrant district. You’ll gain a deeper understanding of the local food movement, entrepreneurship, community, and the arts & music scene. On this tour, stroll to experience numerous brand-new murals, the realization of the Festival’s vision. Your docents will share the knowledge they’ve gained from the artists as they were painting their murals throughout the Festival. We will explain how this project came to be and what it means to the Eastern Market District and to Detroit. For more information about Murals in the Market, visit their website.